Its almost six months since I planted a curry tree in my garden and now, it has taken its place firmly and produces bright, young, cheerful leaves. Incidentally, it is so near the kitchen window. The fresh leaves are so young and tender as compared to the ones that we buy from the market. The curry tree, popularly called kariveppilai [கறிவேப்பிலை - ( kari-curry, veppu- neem and ilai-leaf )] in Tamil is a wonderful addition to the garden. You can hardly find a south Indian dish that is not spiced up and seasoned with the curry leaves. They are also used to prepare exclusive dishes like Kariveppilai chutney. 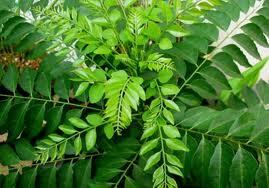 The medicinal properties of the curry leaves as anti-oxidant and anti-diabetic are well known. One other popular benefit of the Kariveppilai is that consuming it is believed to add black color to hair and prevent hair from graying. India also exports curry leaves to other countries. I got a curry leaf plant last week, waiting for new leaves!